More and more chronic smog emergency in Italy: unbreathable air in big cities with a “red code” for air quality in 2017, due to the high concentrations of fine particles and ozone. 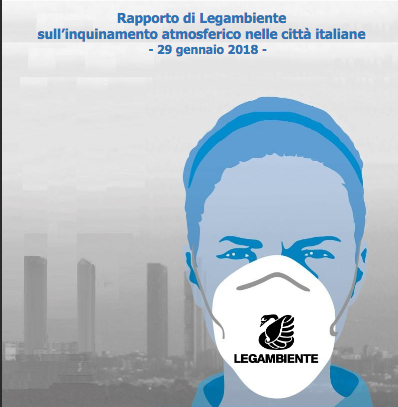 The report “Mal’Aria 2018 – Europe calls, Italy answers” on air pollution in Italian cities that Legambiente presented on January 29th takes a picture of the poor situation of air quality in the Country. This happens just on the eve of the Brussels summit on air quality, a meeting, addressed to the eight countries in the infringement procedure, including Italy, and strongly wanted by the European Commission. The EU also launched an ultimatum to our country, asking the Minister of the Environment Galletti to inform on measures planned by Italy on air pollution. In the absence of concrete measures, there will be a referral to the European Court of Justice with inevitable and extremely high fines for Italy. According to the report, in 2017 in 39 Italian major cities, at least in an official urban monitoring station, exceeded the annual limit of 35 days for fine particles with a daily average of over 50 micrograms /cubic meter. The top positions of the ranking are all prerogative of the northern cities, especially those in the Po Valley area, as Torino is reporting the worst performance at national level. Legambiente also reports data about Ozone threshold overpassed. The importance of this pollutant is often underestimated, despite the estimates of the European Environmental Agency (EEA) showing 13,600 premature deaths due to ozone in Europe in 2015, of which 2,900 only in Italy. There are 44 cities that have registered Ozone level higher than the limit for more than 25 days in the calendar year: Among the worst cities, which have exceeded more than three times the limit allowed, there are, Varese, Bergamo, Lecco, Monza, and Mantua, all of them in the CAPTOR Italian testbed.